Ordinarily I wouldn’t come back here, to a bar created by a friend but then sold to a stranger. No matter why or how it was sold, it just wouldn’t feel right. Disloyal. But my brother is playing guitar here, something he doesn’t often do, and family trumps friends, so here I am, sitting on one of the microsuede banquettes, so comfy, staring at this beautiful room. Chandeliers dot the high ceiling. A magnificent blue oil painting is propped casually on the fireplace mantel. Originally he was going to put a mirror there, but when he found the painting it was just too perfect. Across from me, a huge blue built-in holds wine bottles and almost blends into the muted green of the walls, softening the urban feel, making it all French and luxey. It strikes me that the walls don’t care who painted them. They’re just here being beautiful. 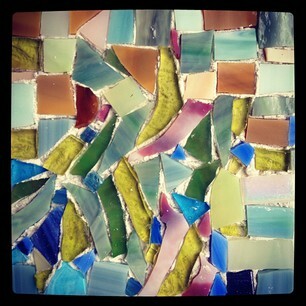 Yesterday was mosaic class. Random people drifted in just before and just after 9am, new to each other, new to the space, new to the class. Where should I sit, at which of the many square, brown-paper-covered tables, who looks friendly, should I sit alone, is that only remaining stool too close to the next one? I took the stool at the table closest to the cookies. Another woman sat next to me, after pulling one stool away so she could space out all the stools on our side a little farther apart. I watched her squeeze antibacterial gel onto her hands. Another woman sat down across from us. She cracked jokes about her Diet Coke addiction, getting lost on the way here, and how she was probably the only sucker to pay full price for this workshop. “I did, too,” I said, the only other non-Groupon. Did you find the analogy? See, all these random-seeming human actions were like the random-seeming bits of glass we’d soon be cutting and arranging on our little training tiles. You watch someone placing a little green tile next to a yellow one, then removing it and trying an orange one, then going back to the yellow but snipping it in two, there that’s better…and it doesn’t seem to make sense. But when the whole piece is assembled, set in black or gray or white thinset, the pattern emerges. By noon, we were all chatting away as if we’d known each other forever, each table of people like each tile on the table like each piece of glass on a tile, each with its own logic which is revealed in relation to the whole. The antibacterial woman works with “lots of sick people,” as she put it, so the gel makes perfect sense. After 25 years, the jokester quit smoking a few months ago, so she’s taking all kinds of classes “to keep my hands busy,” crochet and pottery and now mosaic, and the costs add up. I skipped breakfast because I have trouble being somewhere at 9am, so the cookies made me feel “safe.” Nothing random at all, except the last set of quotation marks.